High stakes for the Venezuelan working class | Fight Back! President Maduro with trade unionists. Chicago, IL - The contradictions at the heart of Venezuelan society have burst asunder. A fierce struggle is now underway to determine the foundations of the country's future. The Venezuelan bourgeoisie have wholeheartedly decided that they are willing to endure civil war and foreign invasion so long as it leads to the repression of the upright masses. The working class and other popular sectors, meanwhile, can no longer tolerate the economic suffering inflicted upon them from the business owners, and are ready to do battle against any invaders that seek to return their class enemies to power. From this struggle can only emerge either the most vicious reaction, or a qualitative leap forward in the struggle to establish a real socialist state. All depends on the strength of the Bolivarian revolutionary movement, and above all on the leadership of this movement by the advanced detachments of the working class. This in turn depends on their strength of organization, their ideological firmness, and their capacity to carry out every form of struggle necessary to beat back imperialism and its running dogs. As the United States and its proxies inch closer to war, it is important to reflect on what is at stake for the Venezuelan working class. Over the past 20 years of the Bolivarian Revolution, the workers have built power for their class and for all oppressed sectors. While there is more to be won, the concrete victories must be held up, because they are what will be defended in the coming days. What have workers won in these two decades, and what still must be won for them to become the leading class in Venezuelan society? When Hugo Chávez was first elected president in 1998, the Venezuelan labor movement was led by class collaborators. It was dominated by the Democratic Action (AD) party, which acted as one of the main defenders of bourgeois rule during the 40 years of the Fourth Republic (1958-1998). They had done everything they could to repress working-class struggle and ensure that oil production continued to serve foreign interests. Chávez's election was a rejection of AD rule, and the party opposed his movement from the start. When the Venezuelan Chamber of Commerce orchestrated a coup in April 2002, the AD trade union leaders of the trade unions cheered them on. They did the same when managers at PDVSA organized a lockout of the country's oil industry in the spring of 2003, sending the economy into free-fall. By then, the AD was incredibly unpopular with the working masses, who saw their interests clearly represented for the first time by Chávez and his administration. Bolivarian trade unionists organized to oust the class collaborators from leadership. In the midst of the 2003 lockout, they founded a new federation - the National Workers Union (UNETE) - and called on unions across the country to break from the AD-led Venezuelan Labor Confederation (CTV). The old formation collapsed as local after local split off and joined UNETE. Over a period of several years, UNETE was replaced by the Bolivarian Socialist Central of Workers (CBST) as the main labor federation of the country and of the Bolivarian movement. Today, the CBST is a key player in the Bolivarian Revolution and works to ensure that the working class is active in the constant struggle for political power. Many of its leaders have been brought into positions in the national government, such as Eduardo Piñate, the current Labor Minister. Communists play a critical role in the labor movement. A good example is the CBST federation in the industrial state of Lara, which has been led by the Marxist-Leninist Labor Current (CSML) for nearly a decade. A major step forward in the Bolivarian Revolution was the consolidation of many of its political organizations into a single party, the United Socialist Party (PSUV), in 2008. Many of the advanced workers were now brought together into one body, although critical elements of leadership remained outside of the PSUV, such as the Communist Party. The consolidation of parties meant the bringing together of the many classes of the Bolivarian movement, and internally there is a struggle for which class will lead. While the PSUV leadership is mostly made up of petty bourgeois elements (military officers, professionals, professors) the workers, who make up the vast majority of the party rank and file, are well-represented at all levels of the party. The great example of this, of course, is Nicolás Maduro himself, the bus driver and trade unionist who became the president of Venezuela and the leader of the Bolivarian Revolution. It cannot be disputed that the working class holds significantly more economic power today than it did 20 years ago. In general terms, the Bolivarian process can be defined by a working class on the advance, and a bourgeoisie on the retreat. One concrete measure of this shift in power is in the types of labor laws that have been won. Today in Venezuela, workers in all sectors have the right to form a union, to strike, to occupy their workplace, and are legally protected from mass layoffs and firings - courtesy of the Organic Law for Work and Workers (LOTTT) passed in 2012. They also have the right to elect delegates from among themselves to ensure that their bosses are meeting safety and environmental standards, and are legally empowered to levy fines, and even shutter, non-compliant companies - courtesy of the Organic Law of Prevention, Conditions and Work Environment (LOPCYMAT) passed in 2005. These constitute some of the most progressive labor protections in the world, and far surpass the repressive laws that we workers live under in the United States. The depth of coverage of the LOTTT and LOPCYMAT reflect the intensity of class struggle in the past 20 years. Strike waves hammered the bourgeoisie, and led not only to significant economic victories but political ones as well, such as the state seizure of companies and even shifts in the political direction of the government. For example, the 2008 strike at the Sidor steel complex - the largest in South America - led Chávez to re-nationalize the plant, fire the Labor Minister, and replace Sidor's CEO with an elected "worker president." When the Constituent National Assembly (ANC) was seated in August 2017, it ended nearly two years of political gridlock. Contradictions were sharp due to the greater politicization of the working class - and its corresponding desire to see deep revolutionary change happen - and the increasing isolation of the bourgeoisie, and as such the ANC delegates, many of them workers themselves, moved to ratify new laws to reflect the changing conditions. They passed the Constitutional Law of Workers' Productive Councils (CPTs) in February 2018. Workers now had the legal support to do what many had done already - form workers councils at their companies to take over production and redirect the productive capabilities to meet the needs of the nation instead of the drive for profit. Venezuelan workers are not only building class power in the workplaces, but in society as a whole. Today tens of thousands of communal councils exist, forms of local self-government established by workers and other oppressed peoples to run the daily affairs of their neighborhoods. As the Bolivarian process has deepened over the years, the communal councils have been consolidated into communes, which bring communal councils together with "socialist enterprises" that produce to meet the needs of the people in the area. Some communes focus on the production of food, others on cultural work, yet all represent the same thing: workers having control over their own lives. Today there are thousands of communes across Venezuela, and the process to build them is ongoing. They are a true inspiration to Marxist-Leninists in the country, who demand that the current bourgeois democratic state be replaced with a "worker-campesino-communal state." The past six years have been brutal for the Venezuelan people. The plummet in oil prices from over $160 to less than $60 a barrel - a deliberate act by the United States - meant that 95% of Venezuela's exports lost over a nearly two thirds of their value. The economy buckled and there was serious doubt as to how the government could maintain their social programs. It was amid this crisis that the bourgeoisie launched their economic war, with a single goal in mind: to break the morale of the Venezuelan people in order to bring down the Maduro government and end the Bolivarian Revolution. Goods were hoarded, prices were hiked exorbitantly, and subsidized basic goods were smuggled out of the country. Business owners openly broke the country's labor laws, engaging in mass layoffs and shuttering plants without any warning. As the economy spiraled into crisis, the working class and the poor were made to feel great pain. 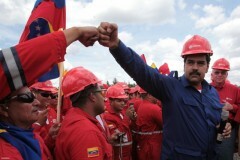 The working class responded with strength, backed to the hilt by President Maduro. Shuttered plants were occupied and either turned over to the state or taken over by a commune. To counter the worst effects of the economic war, Maduro led the creation of Local Committees of Supplies and Production (CLAP), which to this day deliver free food to millions of the country's poorest families. In the past year, the government called for the forming of a "new economy" as the way out of the crisis. Workers took it upon themselves to renew the country's productive capabilities in order to meet the needs of the people. Groups like the Productive Workers Army travel the country, repairing factories and other productive means that have fallen into disrepair and repurposing to meet the population's immediate needs. The government has announced a series of "socialist micro-missions" which amount to handing over to the workers key sections of the state sector to reactivate production. It is a provable fact that no social stratum has done more to pull the Venezuelan people out of the economic crisis than the working class, and they do so in the interests of founding a new, socialist society. Mountains have been moved in Venezuela. Workers are stronger and more well-organized in the economy and the broader society than they have ever been. They have more to lose than we can imagine if imperialism's running dogs retake power. They will defend their victories by all means available to them. But more mountains must be moved. Marxist-Leninists in Venezuela say that for the revolutionary struggle to succeed, there must be immediate action against all sources of corruption, bureaucratism, opportunism and reformism within the ranks of the movement. Space must be made for the workers to become the vanguard force of the Bolivarian process, and they must be given the support necessary to break bourgeois rule. These are not demands for an unforeseeable day down the road - they feel within grasp. The immediate task of the movement is the defeat of imperialist forces and their domestic cronies, the bourgeoisie and the forces of fascist reaction. If they win this battle, then the world belongs to them. Sean Orr is a trade unionist, a writer for Fight Back! and a member of Freedom Road Socialist Organization.